Many people look for the best bench vise under hundred dollar price range. We have looked at the best bench vises for the money and this is the list we came up with. Remember that this is our list and does maybe not reflect the opinion of other people we all have a different opinion about the best vise brand. In our reviews we looked at the price compared to the quality based on reading on consumer site, manufacturer sites and forums. 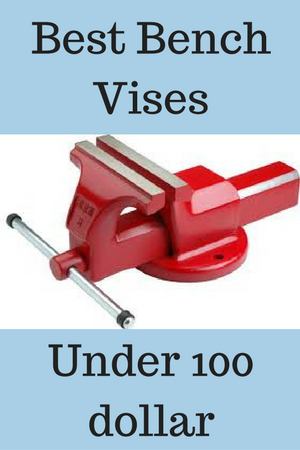 We still urge you to do your own research to find your best bench vise under $100. There is a discussion if Yost vises are made in the USA or in China and it seems that it is made in China. For a small and light duty this vise will work very well. After receiving the vise it is advised by many people to grease it right away. It only comes lightly oiled. The handle bar seems to be a little light and I read several times that it bends a little, not beyond not usable anymore, but still. If you use this Yost swiveled bench vise at home or for light duty it will do, but for heavier work I suggest a larger mouth width. The main complaint we found was that the mounting holes in the base were suppose to be 3/8 inch but they are smaller and probably 5/16 inch. Many people use this Tekton vise to work on their guns and are pretty happy with it. That kind of proofs that it is for light duty work. The anvil is a nice feature, but I recommend never to use any vise as an anvil. In my opinion it will sooner or later damage the cast iron, but maybe I am wrong. Overall this is a nice vice for hobby and light use for an affordable price of under 100 dollar. The saying you get what you pay for is something that would apply for this Performance W3903 vise. The prices for almost all their vises are very affordable and the quality is okay for light or medium heavy duty work. The finish a little rough sometimes and it does need some grease after installing it. Overall again a decent bench vise that has a 360 degree swivel. Like we always recommend is not to use the built in anvil to heavily. There are many other sizes available by Performance. I was a little confusing to dig through all the information of this Irwin 6 inch bench vise 226306ZR. Some remarks were made that the picture you see above is not what you get. The real thing seems to be better quality. The heavy duty in the title is a little too much. This is a general vise for general use and nothing more. Just like most vises in the under 100 dollar price range. For heavy duty you will pay a lot more of-course. This vise and its 360 degree swivel is great for home and light shop use like for working on guns or golf clubs, like was mentioned. Overall this is a nice vice and although not top quality it is good for normal use. I found that the manufacturer advises against using the anvil as a “real” anvil and only for light work. Our rating of 4.2 is based on all the research we did on several sites. This vise is made of steel and not of cast iron. Made for light duty although I read some good things about it holding up pretty good overall. Although this vise is not made in America it seems that it is coming from Czech republic and this maybe explains why a lot of people rave about the quality. A retired tool and die maker wrote that this is not you average harbor freight quality since it weighs a lot more than comparable brands. It is impossible to tell you what is the best bench vise. It all depends on what you will use it for and how much you are willing to spend. When you ask yourself the question how much is a vice. You find that they range from under 100 dollar like we did in this post or you can spend as much as you like to if you are into the more heavy duty vises. Overall you can say that a bench vise under $100 is best used for light work at home and not really for heavy or industrial use. In the future I will probably do a best bench vise under $200 review and see what I can come up with in the price range 100 – 200 dollar. Read all our Bench vise reviews here!